SoarPay is the #1 merchant account for doc prep businesses. The #1 Choice For Doc Prep Merchant Services. Most merchant services providers do not accept businesses operating in the doc prep industry for two reasons:  document preparation businesses face significant chargeback vulnerability, stemming in large part from customers who are either attempting to get the service for free by charging it back on their credit card (so called “friendly fraud”), or from customers who are attempting to circumvent the company’s refund policy due to their dissatisfaction with the service provided, and  because the underlying documents prepared or services rendered may be regulated, ensuring a credit card processing applicant is complying with the appropriate regulations requires that that the credit card processor engage in extra underwriting due diligence. Due to these two reasons many credit card processors simply decline to offer merchant accounts for the entire doc prep industry. 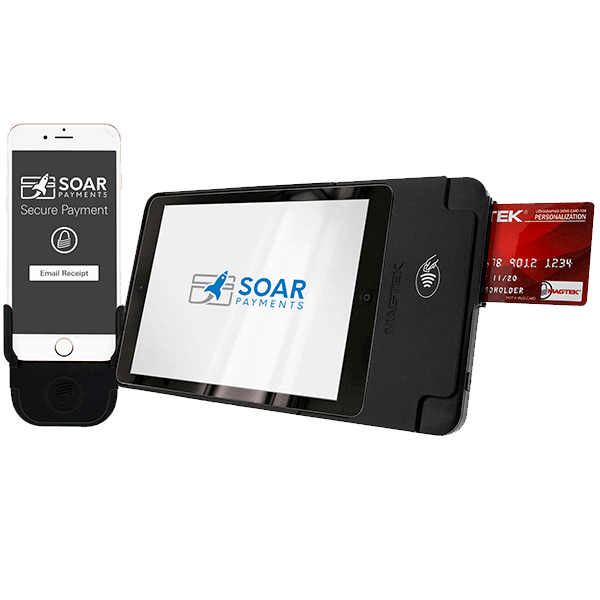 Soar Payments, by contrast, has proudly offered merchant services to the document preparation industry since its inception. Our extensive relationships with credit card processors and sponsor banks who have the capability to underwrite regulated industries, combined with our integration of fraud and chargeback fighting technology, uniquely positions Soar Payments to provide low cost reliable merchant accounts for doc prep related businesses. DebtPayPro CRM, LoanPost (CRM & LOS), Captaloans (CRM & Tracking), SX3 (Loan Mod & Short Sale 10.0, Debt Settlement 3.1, etc. ), Cimmaron CRM, LendingWise (CRM & LOS), plus many other loan servicing and hard money loan management software platforms. 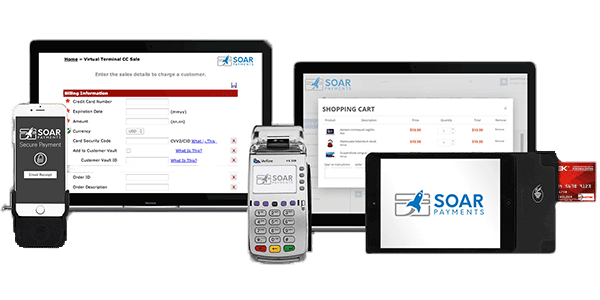 Soar Payment’s document preparation merchant accounts can be integrated with most other software or CRM platforms which are compatible with the Authorize.net, NMI, or USAePay payment gateways. 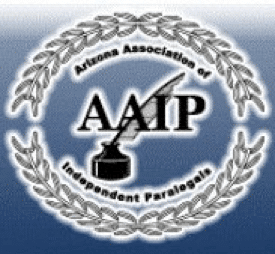 Soar Payments is the preferred payment partner of the Arizona Association of Independent Paralegals. Soar Payments is 100% committed to the long term success of the document preparation industry. As such, we’re proud to announce partnerships with leading industry organizations, including the AAIP. 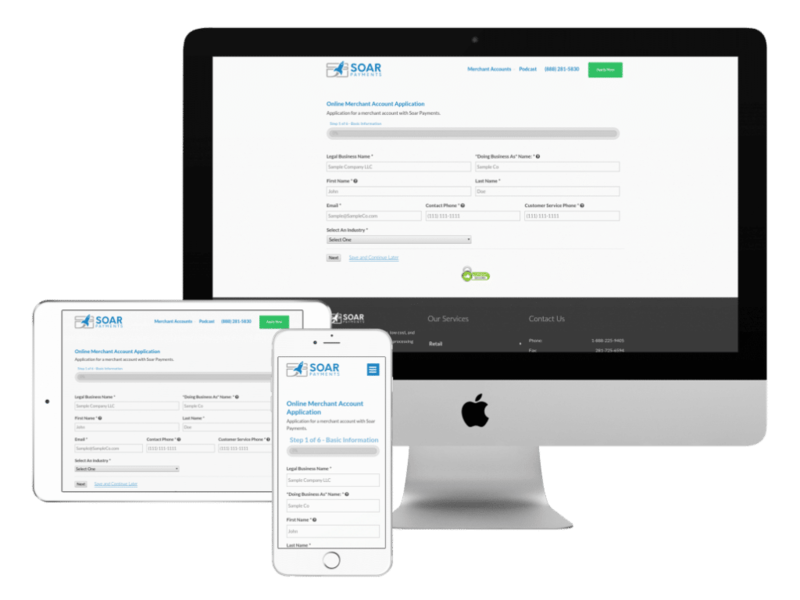 Soar Payments offers a full spectrum of merchant accounts for businesses in the document preparation industry. 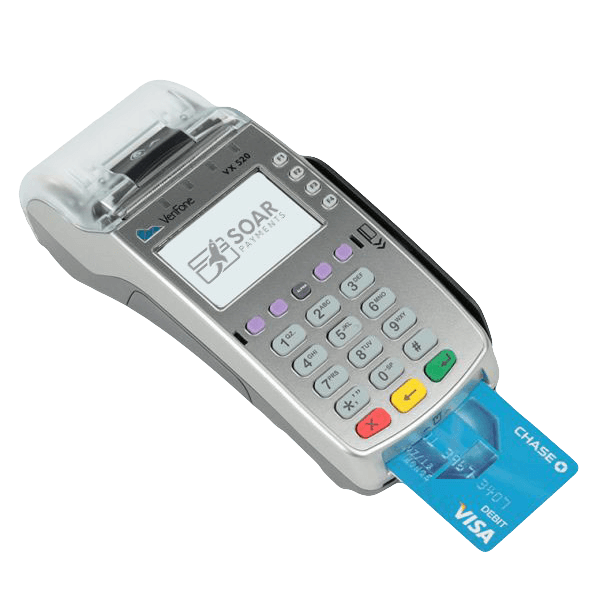 A retail merchant account enables your business to accept face-to-face credit card payments from customers via a traditional credit cad machine or point of sale system. Ideal for doc prep businesses operating in a storefront or retail setting, typically retail accounts are the least vulnerable to fraud and chargebacks and therefore are priced lowest. A mobile doc prep merchant account allows a business to accept face-to-face payments via a credit card swiper that attaches to a mobile phone or iPad. Ideal for businesses that operate outside of a traditional storefront, but who still primarily accept in-person payments, such as at conventions, conferences, or on location with the customer. These accounts are priced similarly to retail as they have lower fraud and chargeback risks. Commonly called payment gateway accounts, these are the most common type of document preparation merchant account, as they enable businesses to accept payments over the phone. 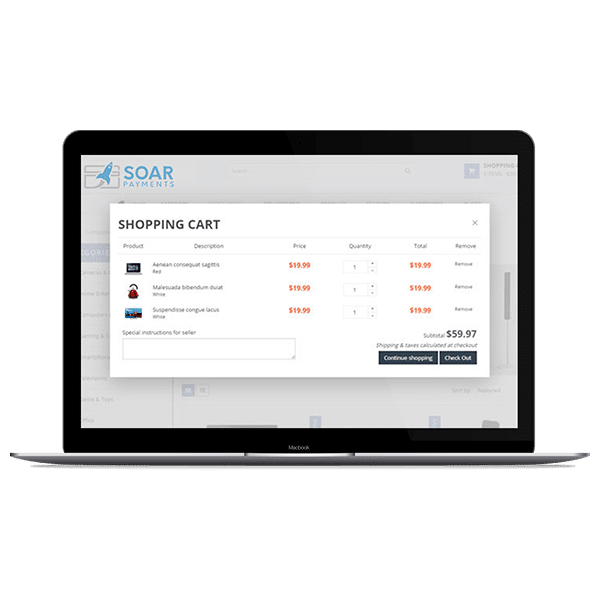 Due to increased chargeback and fraud risks, Soar Payments offers integrated fraud and chargeback prevention technology with these merchant accounts. Document preparation related businesses that sell products and services online need an eCommerce merchant account. Our eCommerce merchant accounts integrate with most major website platforms and payment gateways, making setup simple. Due to this payment type’s vulnerability to fraud, we offer integrated chargeback and fraud technology with these accounts. 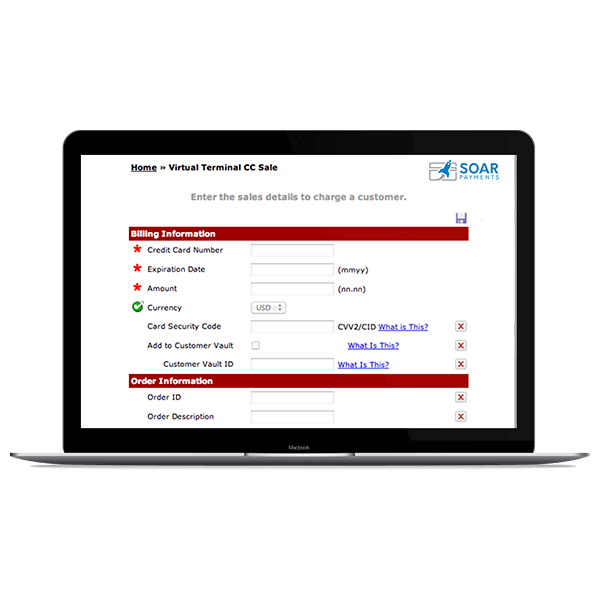 ​​Is Soar Payments compatible with my existing doc prep CRM / LOS software? Doc prep businesses — whether they focus on legal doc prep, student loans, or business doc prep — typically have a preferred CRM, LOS, or loan management software platform they use. 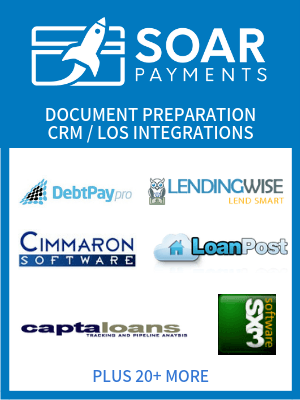 Because Soar Payments works with most major payment gateways (including Authorize.net, USAePay and NMI), our merchant accounts integrate with most doc prep software suites including: Debt Pay Pro, Loan Post, Captaloans, SX3, Cimmaron CRM, Lending Wise, and many others. What types of document preparation industry businesses do you accept? Student Loan Doc Prep, wherein companies prepare application forms for student loans or filling out student loan forgiveness and loan consolidation applications. Legal Doc Prep, in which the service provider assists in the completion of basic legal forms such as Wills, POAs, etc. Business Doc Prep, where the company completes basic business documents such as application forms, payroll forms, contracts, etc. Personal Identification Doc Prep, wherein the company assists in the completion of work and travel visa applications, other visa applications, and other documents similar thereto. What criteria does my doc prep business need to meet, to be approved for a merchant account by Soar Payments? To be approved, doc prep businesses must meet the the following criteria: if related to student loan debt, must only help prepare documents; must not help negotiate / consolidate debt.